Bandsawn hardwood decking provides a rustic charm and combines good grip with ease of cleaning. Hardwoods ex 25 mm thickness: Eucalyptus pilularis, E. muelleriana, E. globoidea, E. microcorys, E. saligna, E. botryoides. Thermal modification is a recent innovation which improves durability and potentially allows non-durable species and sapwood to be utilised as exterior decking exposed to the weather. Durable eucalypt hardwood decking from species such as E. regnans, E. delegatensis and E. nitens may become available as a high-quality decking product using this environmentally friendly process. Farm Forestry Timbers have a trial underway of thermally modified E. regnans decking and a further trial of thermally modified E. regnans for above ground durability. Both of these trials are to assess building code compliance for durability performance. Machined grip tread. This is often laid face down so the wood has less contact with the joists below. Less moisture is trapped, improving durability. Bandsawn face, arrised.Thickness ex 25 mm, bottom face dressed to give consistent thickness (usually around 23 mm). Top edges arrised. Machined grip tread. Three thicknesses, ex 40mm (machined to 32 mm), ex 32 mm (machined to 25 mm) and ex 25mm (machined to 19 mm). Grip-tread grooves can be placed either up or down, depending on personal preference. Placed down there will be better air movement at the point where the decking timber contacts the joist, thus allowing the timber to dry and improving durability. Grip-tread may be useful placed upward where the deck is often wet and slippery. Our decking grades are here. 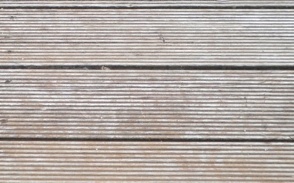 Decking is available only as mixed lengths. Shorter lengths are mixed with longer lengths in the packet. Short lengths are scattered around the deck by the installer. Our grade specifies 900 mm as the shortest length to cover two joists with 450 mm between centres. It is important to know the moisture content of timber being laid to determine the gaps between boards. Kiln dried timber will swell more than air-dry timber and green timber will shrink significantly. The expansion gaps will thus vary according to how dry the timber is. Unless a higher moisture content is agreed to, our grades all specify timber dried to 20% moisture content or less. Annular grooved nails are recommended. Pre-drilled pilot holes are recommended to avoid splitting. Types of suitable fixings available include stainless steel nails, screws and sharksteeth (hidden fasteners). Bleeding of freshly laid timber can be an issue where concrete plaster or tiles can be stained.